I recently got the opportunity to try out and review Annie's Organic Rising Crust pizza through Mom's Meet. At first I was thinking that just sounded odd- to me organic means healthy and pizza is usually not. But I was excited to give it a try. I had never tried anything from Annie's before and I'd also never been to a Whole Foods store, where the pizza is sold. 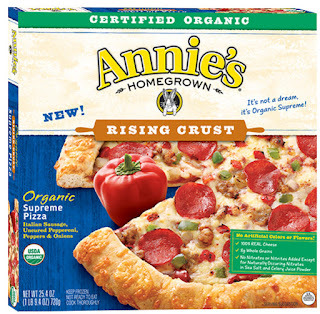 Annie's Organic Rising Crust Pizza is certified organic, with 100% real cheese and the meats have no nitrates. They have 4 flavors- 4 Cheese, Supreme, Uncured Pepperoni, and Spinach & Mushroom. I chose to get the Supreme because that's the kind of pizza my family usually likes, and it looked delicious. I was a bit disappointed at the small size, but it was enough for our family, just not enough for seconds (well, except me, I took the last slice before anyone else could claim it!). Despite the size I was impressed with the thickness of the crust, and it smelled yummy before it was even in the oven. I was very happy with the taste of all the toppings. The crust by itself was just ok for me, though the texture was great, just the right amount of softness vs. crispness. And all together the pizza was delicious. My kids gobbled theirs up quickly and my husband said it was pretty good for frozen pizza. I agree. I still prefer pizzeria pizza but as far as frozen pizzas go Annie's Organic is very good and I felt good about feeding my kids something that was made with organic products. I'm not sure if I would buy it again, but mostly because the nearest Whole Foods is 30 minutes away and the cost for one small pizza is $9.99, but if it were offered in a store nearer me and on sale (when I got mine it was on sale for $7.99, not too bad) or bigger size then I would be much more likely to purchase it. Would you like a chance to win a free Annie's Organic Rising Crust Pizza? 3 lucky readers will win a coupon for one free pizza, redeemable at Whole Food's Market. To enter visit Annie's Organic and let me know which pizza you would like to try. For an extra entry like Annie's Organic Facebook page and come back and leave another comment. Contest open to U.S. residents (and you may want to make sure you have a Whole Foods nearby!). Contest will end Friday, April 27, 2012 at 10pm EST. 3 winners will be chosen at random using Random.org. I would probably try the supreme. That looks yummy! I'd like to try the Four Cheese.